At PMA 2006 Canon announced their first 12 pigmented ink printer: IPF 5000. We have now this printer installed in our printing studio. Once you have the printer out of the box (it is very heavy at 99 lbs. and you need a second person to get it out of the box) the installation went smooth and we started printing about 30 minutes later. Twelve inks is impressive and we will likely check at a later time whether it really improves the gamut in practice (there are indications though that it matters). The ink tanks normally carry 130ml ink but the starter ink tanks hold only 90ml. While we find it kind of strange to have starter ink tanks with less inks it is on the other side no big deal if you deal with a printer of this level. 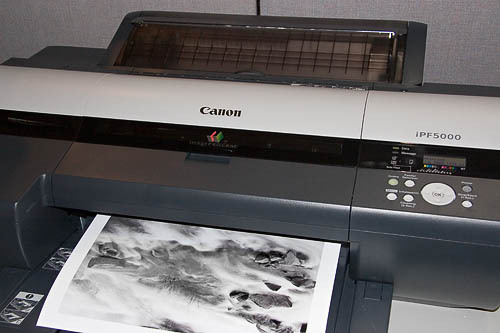 Important to note is that the IPF 5000 does not require to switch inks when changing from matte to glossy media or back. 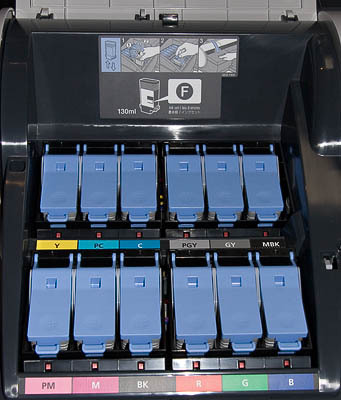 Different from many other printers you need to setup the right paper size and paper type on both ends: the printer and the driver. If there is a size mismatch it won't print. This maybe sometimes a hassle but no big deal. On the other side it prevents a bad mismatch. If the paper type does not match this is less of a deal as you get a warning. Better of course have both sides match. The software comes with an extra utility to add new paper types. If we use non Canon papers we prefer to set both ends to a paper that comes close. Why don't we just say printing here and mention Photoshop? 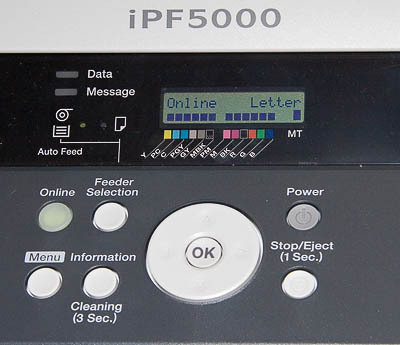 The reason is that the IPF 5000 software comes with an extra Photoshop Export plugin to ease printing. If you use other applications you may need to use the normal drivers. What is so special about this Photoshop plugin? We will compare the normal driver and the plugin sometimes later. Because we mostly print from Photoshop anyway there is no reason for us not to use this new plugin. This plug-in controls your complete print job with all parameters. In normal color mode you get the following dialog. We never tweak colors in the driver and leave all at the default. We will later also check out the B&W profiling with QTR tools. Overall we love this plug-in and don't want to be without. We have to check into the 16bit operation later. We will cover different papers used with the IPF 5000. "No Spaces on Top or Bottom" prevents paper waste. We found the default border just right for our print and left this option off. 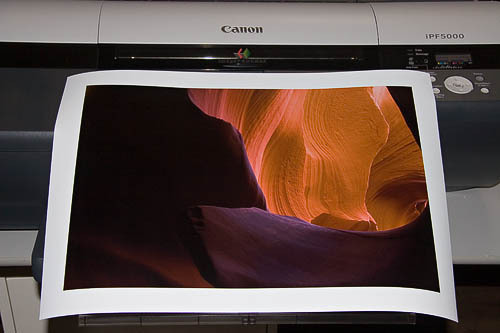 The Heavyweight Satin Photographic Paper did not show up in the printer or driver settings. We used the settings for "Semi-Glossy Photo Paper" and got very pleasing results using the generic profiles of the printer. We have to create more dedicated profiles in the future but are actually very happy so far. To our eyes the color prints look excellent and at 2400x1200dpi 16pass you need a good loupe to detect the dot pattern. Even then the dot pattern looks very smooth. Actually we find the color prints on this as good as on any printer that we used with a Satin paper. Very satisfying. 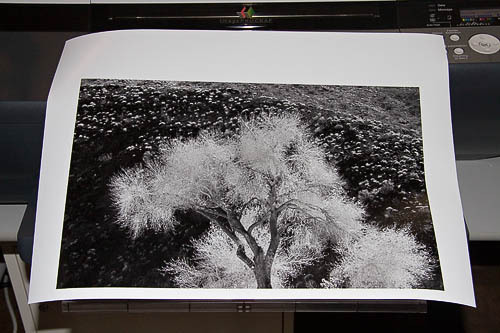 The B&W print was made using the "Auto (Monochrome Photo)" mode and the above mentioned toning settings. There is some slight bronzing visible but really needs a close inspection. We personally don't find this to be a problem even for prints that are in an open portfolio. Otherwise the B&W prints looked excellent and we did not find any objectionable metamerism. For us this printer paper combination provides excellent results. We are especially impressed by the B&W performance.